"Hug in a Bottle "
This is how I described BFR, as a “hug in a bottle”. They give you the emotional support when you need it the most. There are 38 different remedies covering all of our emotions. You may be familiar with Rescue Remedy, often used in times of stress such as bereavement, exams or for a driving test. Rescue Remedy is a blend of 5 BFR and I always have a bottle with me in my handbag just in case. I often mix remedies for my clients as part of the treatment sessions with me, for a small additional cost. If you are having a treatment with me and are interested in trying some Bach Flower Remedies then please let me know before your treatment so I can make sure I have them with me. 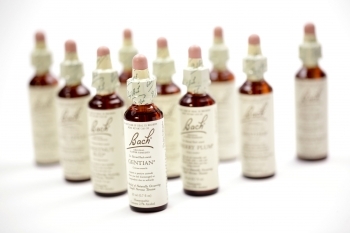 The original Bach Flower Remedies are a safe and natural method of healing discovered by Dr. Bach from 1920 – 1930’s in England. They gently restore the balance between mind and body by casting out negative emotions such as fear, worry, hatred and indecision which interfere with the equilibrium of the being as a whole. The Bach Flower Remedies allow peace and happiness to return to the sufferer so that the body is free to heal itself. How do I mix the Bach Flower Remedies? The easiest and cheapest way to take several remedies at once is to mix them in a mixing bottle. Add to the treatment bottle two drops of each of the suggested remedies or four drops if you are using Rescue Remedy or Rescue Night. Top up the treatment bottle with still mineral water (not fizzy water). The treatment bottle will last you about two to three weeks. You need to keep the bottle in a cool place or in the fridge. If you can’t keep the bottle cool or you want to carry the bottle around with you, you can add a teaspoon of brandy, cider vinegar or glycerine to the bottle before you add the water. How do I take Bach Flower Remedies? Take four drops from the treatment bottle, at least four times a day. If you feel you need to take more that is fine. There is no maximum dose. Hold the dose in your mouth for a few moments before swallowing. You can also add four drops to any of your drink, hot or cold.